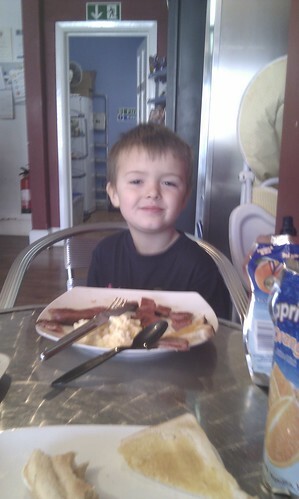 When Oliver was not yet a toddler, I used to take him for toast on Saturday mornings at a local cafe called “Fresh”. This morning we returned, but now of course with his little sister in tow. Surprisingly, given that we haven’t been there since he was a toddler, he remembered the place. He ate much more today than the old days though, that’s for sure. Egg, sausage, bacon and toast. 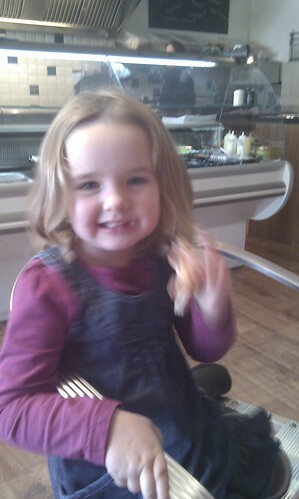 Lucy settled for a sausage barm. Oh and I got an egg barm and a rather splendid mug of tea, not to mention a very friendly welcome. So I can still heartily recommend Fresh. Likewise, I used to take both kids to Tesco for breakfast every Saturday morning, also buying Hayley flowers and a paper along with 4 lottery lucky dips. Now happens monthly with only 2 lucky dips and cheaper flowers!